1. In a small bowl, mix together the flour, sugar and salt. 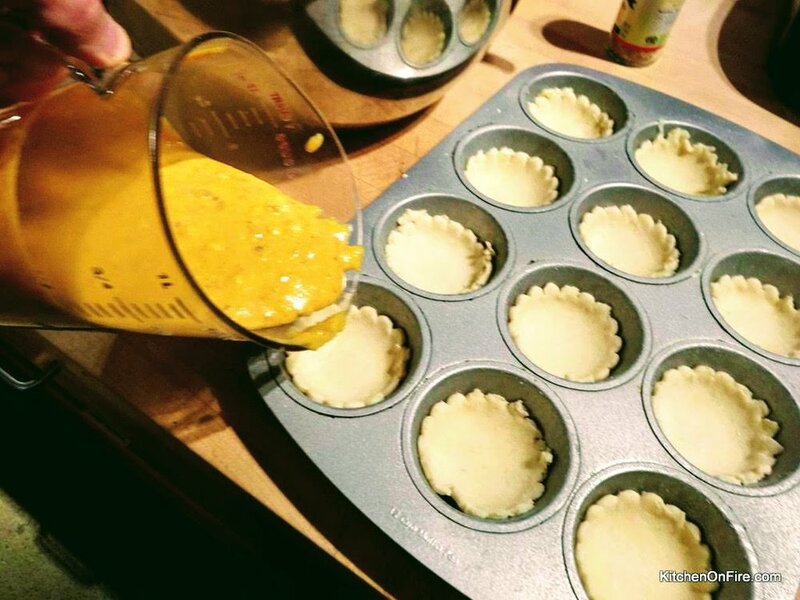 Using a pastry cutter, large-tined fork or a food processor on pulse, cut the chilled butter into the flour until it looks like coarse sand with pea size bits as well. 2. Sprinkle the water evenly over the mixture and toss gently a few times, until it form a ball that holds together. Separate the ball into 2 balls, flatten slightly into thick disk shapes, wrap in plastic wrap, and chill for several hours before using or in the freezer for 20-30 minutes. 3. In a medium bowl, whisk together the pumpkin, chestnuts, cream, milk, eggs, sugar, spices, and salt. Carefully fill the dough all the way to the top. 4. On a lightly floured surface, roll out the pastry dough to 12 inch disks. Carefully transfer the dough on a lined baking sheet. Spoon the fruits on the pastry round, heaping them up, leaving a 2 inch border all around the edge of the dough. 5. Bake pies until crust is golden brown and pies are set and puffed. My tartlets took about 30 minutes. 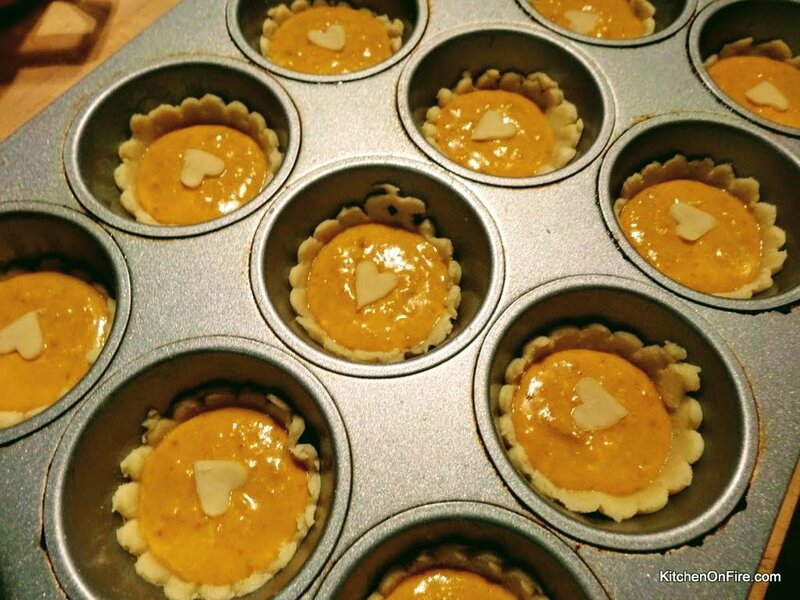 Pies made in a mini muffin tin will take about 12-15 minutes. Cool and Pipe or dollop whipped cream on top and serve! In a large bowl, whisk together the dry ingredients, including jalapenos, until well combined. Form a well in the middle of the mixture. Add eggs, buttermilk, and milk until just combined. Stir in the melted butter until all ingredients are well incorporated. Pour batter into pan and bake for 25 minutes until golden brown and slightly cracked on the surface. Remove from oven. Allow to cool for 5-10 minutes. Remove from pan, slice, and serve. Cut the apples in ½ cubes or ¼ inch slices. In a large non-stick frying pan, melt the butter over medium-high heat. Gently stir in the apples and cook for 3-5 minutes or until lightly browned but not soft. Reserve. In a large bowl, whisk together the milk, cream, almonds, and cornstarch. Add the eggs and sugar. Whisk again vigorously until well-blended. Turn the apples into the mixture and stir gently with a wooden spoon. Lightly butter a tian or gratin dish or an ovenproof frying pan. Spread the apple batter in the dish or pan and place in the oven. Bake for 45-50 minutes or until the batter is set and golden. Sprinkle with confectioner’s sugar. Serve warm.